You’ve likely seen wood shipping pallets piled up next to dumpsters outside local stores. Once the pallet has done its job, which is to provide ease of transport, these plywood structures are often tossed. For those with an eye for DIY, that means free building materials! Sure, they’re usually built from basic, no-frills pine, but there’s something appealing about their simplicity, no? Ever wonder about ways to prolong the life of these utilitarian constructs? 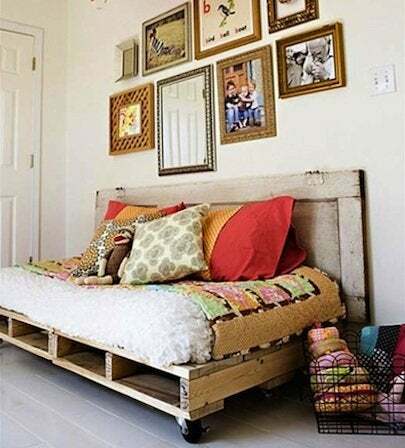 We found five great shipping pallet DIY project ideas for you; scroll down now to see them all! This is an easy and affordable solution for a daybed on a porch or in a sunroom or guest bedroom. By combining two pallets with a twin-size mattress and adding industrial caster wheels available at your local hardware store, you have a great-looking place for guests and family to take a snooze or read a magazine. For more, visit Apartment Therapy. 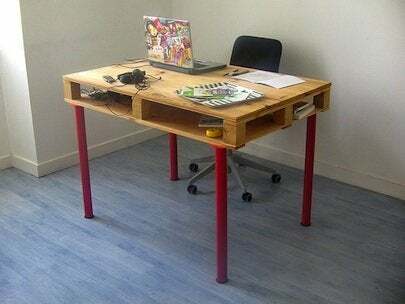 By adding a set of sturdy, colorful table legs (in this case from budget-friendly IKEA), the pallet becomes a super-functional desk with pretty great storage capacity built right in. Instructables shows you how it’s done. This project requires very few modifications to the pallet but goes a long way towards creating rustic charm in the kitchen. 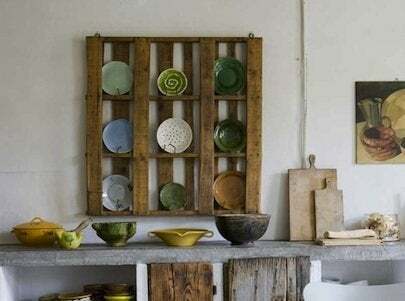 Adding a couple of long nails to keep each plate from falling forward and two eye screws to hang the pallet on the wall, designer Katrin Erens stylishly displays her plate collection. Find out more on Remodelista. 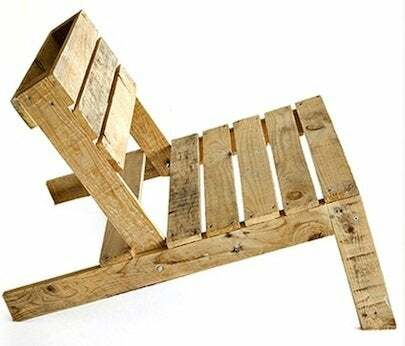 Originally created by Studiomama for display at a design show, this low-slung lounge chair was crafted using two pallets and 50 screws. Instructions are available for purchase on the Studiomama website. 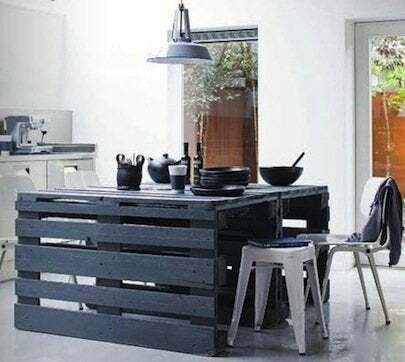 The most ambitious of these projects involves a bit of deconstruction and rebuilding to take a few pallets and build a great-looking industrial chic island. Painted black it’s hard to see the original source of the wood is a lowly shipping pallet! Even more great ideas can be found on Apartment Therapy.